Tears For Hong Kong | What Next? I started to cry yesterday and Dave was puzzled. We were driving to the grocery store and I was reading a note from a Hong Kong friend. She had sent us a little gift and a card in which she wrote about how much she missed us. Dave asked me to read the card’s message out loud to him and I couldn’t at first, because I got all choked up and teary. I had received an e-mail earlier in the week from a school colleague who mentioned several of our former students had talked to her recently about how different school seemed without the Driedgers. Another wrote to say sometimes when a group of our Hong Kong friends are out for supper at our favorite street corner restaurant in Tai Wai they drink a toast to the Driedgers. When I did a Facebook post celebrating finally finishing the history book about our school in Hong Kong, over a hundred Hong Kong friends offered congratulations via e-mails, Facebook and blog comments. Our Hong Kong pastor contacted us yesterday, to express sympathy over the death of Dave’s Mom. Our Hong Kong congregation at Tao Fong Shan had prayed for us and had included Mom’s name in an All Saints Eucharist held on Tuesday. A church friend posted a Facebook comment saying the singing in our congregation just wasn’t the same without the Driedgers’ voices. I realize often how blessed we were having such a rich and varied community that loved us and supported us in Hong Kong. I know we did the right thing in coming back to Canada. Since arriving we’ve had a myriad of meaningful family times and we are settling into our new home here, finding many interesting and exciting things to do. But that doesn’t mean our Hong Kong life and personal connections are forgotten and aren’t missed sorely at times. Perhaps having lunch on Sunday here in Winnipeg with one of our former students and talking about Hong Kong with him, made me even more nostalgic. I know it is a good thing to cry for Hong Kong, especially in these first months away. Our connections with the city were significant and changed us forever. Of course we miss them. What next? Dave and I hope to make a trip to Chicago in November and look up Hong Kong students and colleagues who live in the area. I may fly to Hong Kong when the history book is launched. Hong Kong was our home for six years so it will always be part of lives and every once and awhile I will need to shed a tear for the good times and good people there. 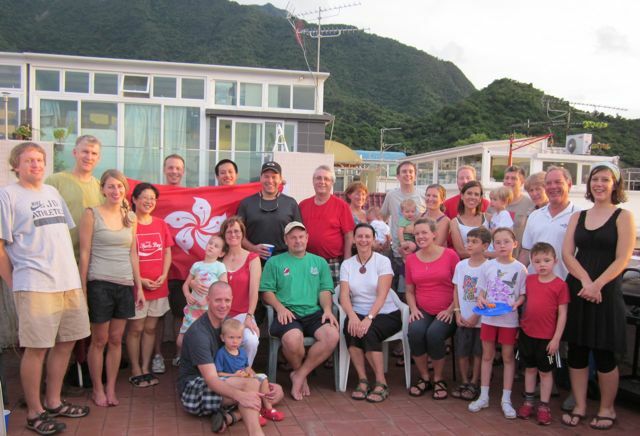 With some of our friends at our Hong Kong Farewell Party. 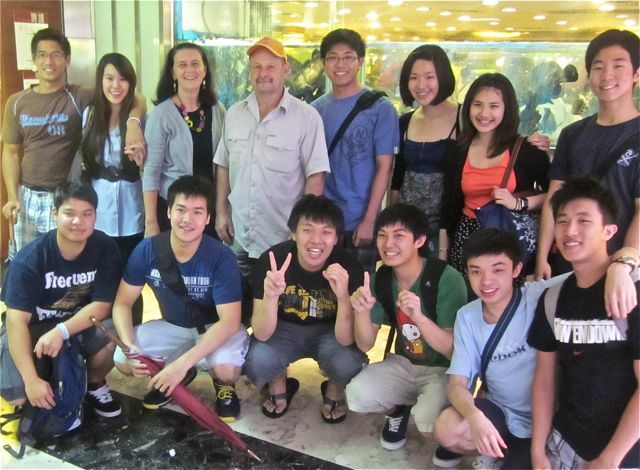 With some of our former students at a farewell dim sum they had for us in Hong Kong. My teacher from People’s Christian Academy told me this.